Starting the screen-type destination indicator production in 1965, we developed the three-color LED destination indicator in 1988 and it was directly adopted for the then newly built cars. This means our product played a role to change the time of screen into that of LED. In recent years, we have been supplying full-color LED indicators which enable white color displaying and ensure good legibility for the elderly people and the persons with imperfect color vision. 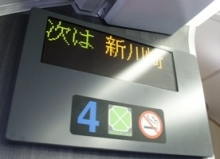 The indicator is installed at the side of car for the passenger to confirm the destination and the train name before boarding. Our interior information indicators were adopted for Tokaido Shinkansen in 1984. Since then many interior information indicators have been used for many types of rail car including commuter trains. These indicators allow the passengers to get many kinds of information even in such enclosed space as the passenger saloon. The indicator is installed above the saloon passage door for high visibility. A large multi-color display screen with a size of 128mm by 1024mm can exhibit various service information such as stop station guide and short news etc. Train travel guidances like as next stop station notice etc. are displayed on the upper area of the indicator screen while operation information on the lower area. This type of indicator is also installed in ordinary cars.